he final act in the play of life will be the mind sinking into the Heart of All, its source. There, only, do we find total freedom, unalloyed peace, and never-beginning, never-ending satisfaction. We, the mind-limited self, get a taste of the mind's sinking into the Heart whenever we fall asleep. But we awake none the wiser. The unripe mind closes its eye when it sinks into its source. The sun disappears below the western horizon when night falls. slower or faster depending on the erosive or traumatic effects of experience. Faulty beliefs about I-amness come into view and thus loosen their hypnotic hold. The seeker may discover the mental umbilical cord that connects the mind with its source and which, unlike the maternal umbilical cord, is never detached from the child. The vibration of that umbilical cord is picked up as a nostalgic longing for Home. The mind-self then has a conscious connection with its source although its conviction of individual-being status, of being or having a separate awareness, prevents it from seeing its source as anything but Other. The Guru or Teacher may appear, either externally or internally, when the mind-self is able to see the Truth as reflected in another apparently individual being or separate intelligence. This form of conscious connection allows Self to suggest directed action to the self: What you're looking for is within. Come Home. The mind-self overcomplicates, procrastinates, and forgets. It gets caught up in the drama of life then gets hit with shocks to its self-sense or individuality sense. In a resulting deflated or depressive state life may seem pointless, and attaining true satisfaction may seem hopeless. The feeling of purpose, which is intuited by the quiet mind, is lost behind the focus on foreground noise. The point or purpose of life is death. The lesson of living is dying. Life is effortful: the doer has to "do" it. Dying is effortless. Life after the "death" or stepping aside of the doer-sense enjoys intervals of effortless "being in the zone." Life after the death of the individuality sense is simultaneously effortful and effortless  and beyond both. 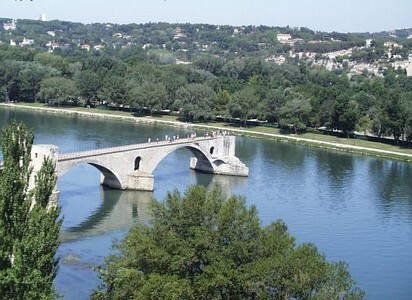 The photo is of the Pont d'Avignon, a medieval bridge in Avignon, France. More articles by website author | Main Articles & Excerpts Page | PSI Home Page | Self-Discovery Portal | Stumble It!